Camp Syncro was at KINNIKINNICK Campground. Yes, KINNIKINNICK. Say that 3 times fast! 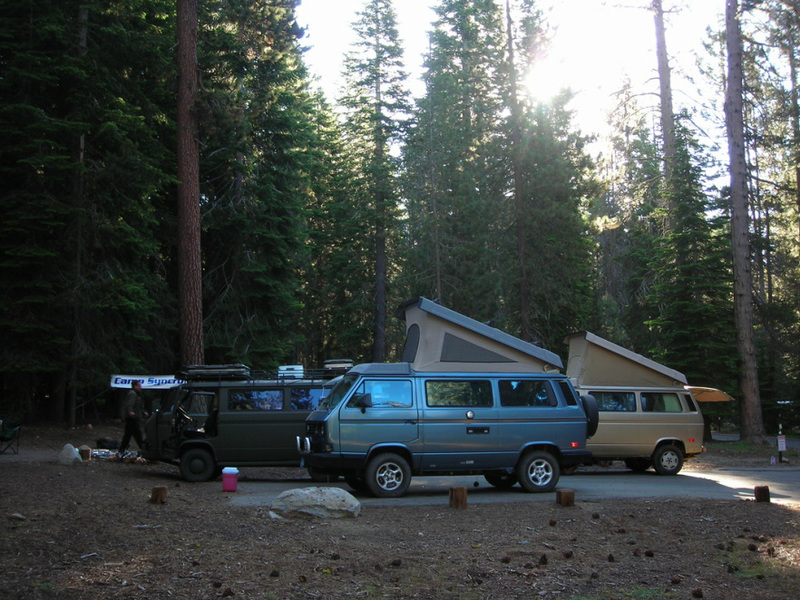 Kinnikinnick Campground is located on the north side of Huntington Lake, near the Kaiser Wilderness, approximately 80 miles northeast of Fresno. The Huntington Lake area offers fishing, hiking, sailing, boating, lake swimming, nature walks, and interpretive programs. Kinnikinnick is a modern campground without hookups. Interpretive programs offer hikes to Indian Pools and Rancheria Falls. Learn about hydro-electric history, Native American history, geology, and forestry. When visiting the area, information can be found at Eastwood Visitor Center. Saturday, July 24th. Initially one reserved spot was slightly isolated from the rest of us, but once we got there we were able to make a swap so our group could be together. The total cost of the campsites was initially $839, and the campsite swap was for a larger spot, so it cost a bit more bringing the total up to about $1,000. Our groups split up the cost on a per Syncro basis of about $100 each. This was the most paid to date for Syncro Safari camping.